The twenty cent coin was first introduced with decimal currency on 14 February 1966. The original reverse design of a platypus remained unchanged until 1995. This denomination has since been used for commemorative designs. All twenty cent coins in the first issue in 1966 were produced at the Royal Mint, London. 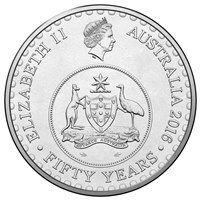 The Royal Australian Mint did not commence twenty cent coin production until the next financial year. Quantities of twenty cents have also been struck by the Royal Mint, Llantrisant and the Royal Canadian Mint. Commemorating the 60th anniversary of the end of World War 2.